Conceptual artist and photographer Simon Freund has built an impressive portfolio brimming with distinct world-remaking intentions. His photographs and installations have a neat, sculptural quality, retaining traces of original functions of the objects in new, ornamental settings. Simon’s works are not self-evident, despite their orderly characteristics. 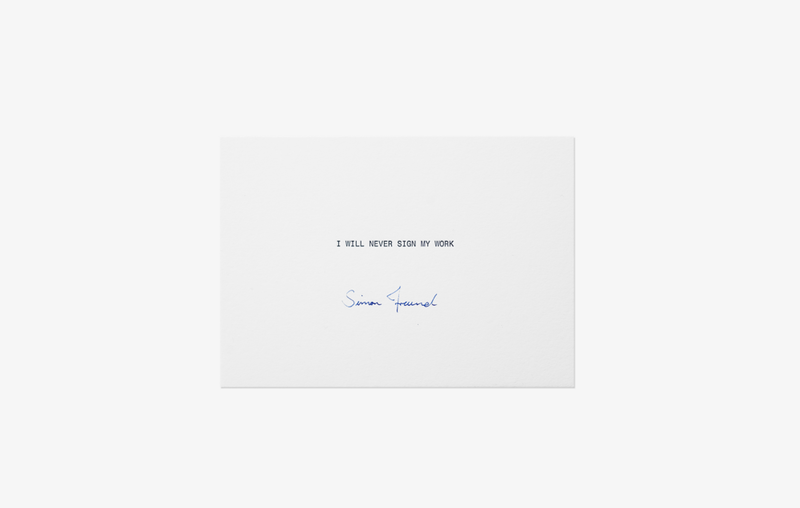 I will never sign my work, 2018. Simon’s works double as commentary on “the condition of their own display,” evoking pioneer conceptual art of the 20th century. They may be seen as meditations on the cultural narratives attached to the objects depicted; however, they abstain from conclusions or ethical judgement. Plastic bottles, chairs, recycled shopping bags, buttons, ladders, shopping carts – they are the subjects of elaborate albeit minimal staging. The final works cross-reference materiality, artistic intention, and image, adding bits of performance and traces of agency to counter the static integrity of the objects. The clinical positioning, against a white void, excludes what the artist deems useless or intrusive. Shadows are eliminated – unnecessary witnesses? The image becomes an object itself, to be handled and reworked; they document their own production and inscribe their consumption; a cycle that can go on forever. Elena Stanciu: Let’s start with a short bio. Who are you, and where do you come from, creatively? Simon Freund: My name is Simon Freund; I was born in 1990 in Königstein im Taunus, in Germany. After school I started my own fashion brand, which I ran for eight years, with a small store in Berlin and wholesale partners worldwide. I then decided that I would rather make art than trying to sell my goods. In 2016 I closed the shop and stopped all my commercial work and began concentrating fully on working as an artist. ES: Just from looking through your work so far, I am instantly curious about your relationship with every object you photograph. Can you elaborate on this? What’s you process when planning a piece? SF: The photography of objects and especially of my artworks plays a huge role in my work and every object carries a certain meaning. Often, it's quite simple questions that I try to present in a very minimal way. The keys in the piece home, for example, represent the sometimes broken or bent and in that sense difficult relationship we might have towards the idea of a home. I use the keys as a visual metaphor for this notion. It's quite a straightforward relationship between object and idea, most of the time. 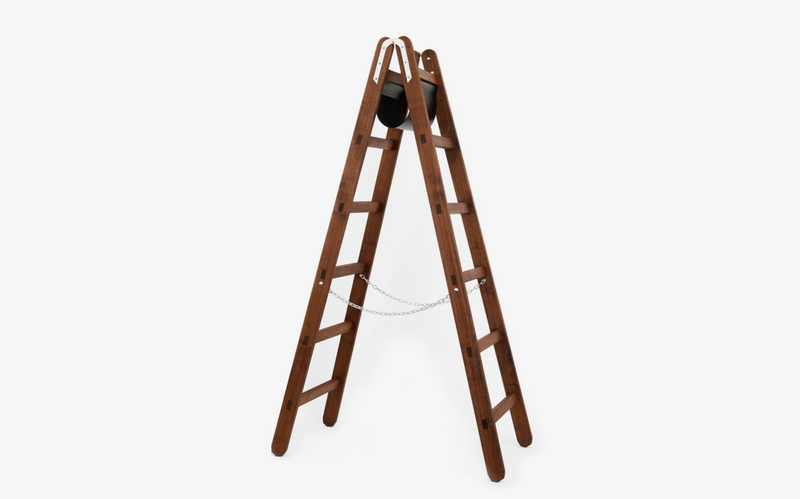 Many of the objects in my pieces are also designed by me, for instance the piece in wooden ladder or 1, 2, 4, 3 . It’s an even closer relationship to these works, as I start on a very early stage to think about the object and different aspects of it. But it's always different – sometimes I start with the idea and sometimes I start with an object; there's no standard procedure. I also work with objects, photography, internet, video, performance; every piece follows a certain concept, but the medium is often quite different, although the look is mostly the same. ES: Maybe it’s my own bias – but I initially feel like all these objects bear a burden of meaning, of a story behind them, or that, as a viewer, I must place them correctly and exhaustively within the larger cultural narrative. Would this be a mistake, when engaging with your work? SF: No, I think that's a big part of me and probably every artists work, that every piece does tell this story that you as a viewer can or can't really know. As I see it, it's an invitation to think about it, in whatever way or context available to you. ES: I’m fascinated with your ongoing project, allipossess.com, in which you register all the objects you own at the time of shooting, and revisit in the event of changes. What inspired you to start this series? SF: I've started allipossess.com shortly after I quit my brand, so the whole idea of consumerism was still very much in my mind and I really wanted to slow down my own consumerism as much as possible. I thought it would be a great idea to get an overview of everything I owned at that time, photograph it and put it on a website, so other people can also see what I own. allipossess.com, 2016 - ongoing project. I quickly realised that I own way more things than I thought and that I also deeply care about what I own and about what others think about me who see my belongings. So, I started to give away most of the things I didn’t really need or like to friends and people who could use it and basically decluttered all of my possessions while photographing them for the project. However, I wasn't too strict with myself and while I do think that I have a rather minimal approach to many things, I still own unnecessary things and things I don't really like per se, but which have a sentimental value, or I can't get rid of. The toughest is giving away gifts. Now I know why I have most of the things I have, and that I really like them, but I also keep some I can't discard. ES: Dealing with clutter and overconsumption is very popular today, perhaps long overdue. Is this something you could weigh in, having such a disciplined view over your possessions? SF: I do think that we own too much stuff and that's one of the main reasons I quit my brand a few years ago. When I started in 2008, I tried to produce my goods as sustainable as possible, at a time where it was still a niche, rather than mainstream. This is an important topic to me, but just as organic food or gender equality, it's nothing I actively talk about because as I see it, it should already be a standard lifestyle. Everyone who wants to consume less in my eyes isn't part of a trend; that's just basic thinking and should be the norm. ES: Your photographs are very neat and minimal – do they reflect an existing lifestyle or desire for one? SF: The minimalism comes down to thinking a lot about the things I do and questioning everything. If I take a photo of a particular object, I come to question the background and realise it would just take away from the thing I want to show. When I write a text I try to reduce it to make it as short as possible and when I buy clothes, I buy clothes for a specific reason, with a clear function, which I can fix when broken, and will want to wear for a long time. The clothing I buy most often uses very basic materials, from brands I respect for their production methods and quality and which are very minimal and timeless. You could argue this is no fun, and maybe reductive; but for me, it’s great not to worry about my outfit, since it’s the same every day. I can use that time more constructively. ES: What role does humour play in your art? SF: I like to laugh and to make other people laugh, so I guess humour is rather important in my life. In my work I try to keep it to a strange minimum though, so that everything I do can be taken very seriously, but leaves room for interpretations, perhaps with a note of humour. ES: Any shows or projects we should look out for in the near future? SF: In February I will be showing four works of mine in Munich, including allipossess.com, countless.info, fiverooms.cam and +49 173 37 42 908, which is also the title of the exhibition. While the show is in Munich, most of the pieces can be seen online. I guess this raises some important questions on art shows in a digital and hyperconnected world; the title is my actual phone number, which can be called from anywhere in the world: a nod to the idea of participation. I also just started a new series of internet paintings, the newest one is edge.simonfreund.com and you're the first one to see it.